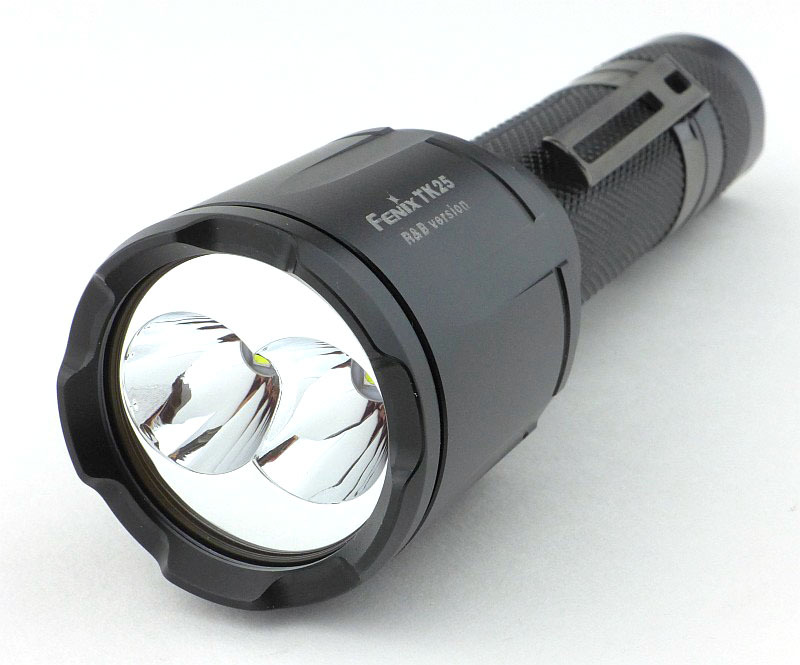 Fenix have embraced multi-coloured, multi-functional lights with many models available in their range. 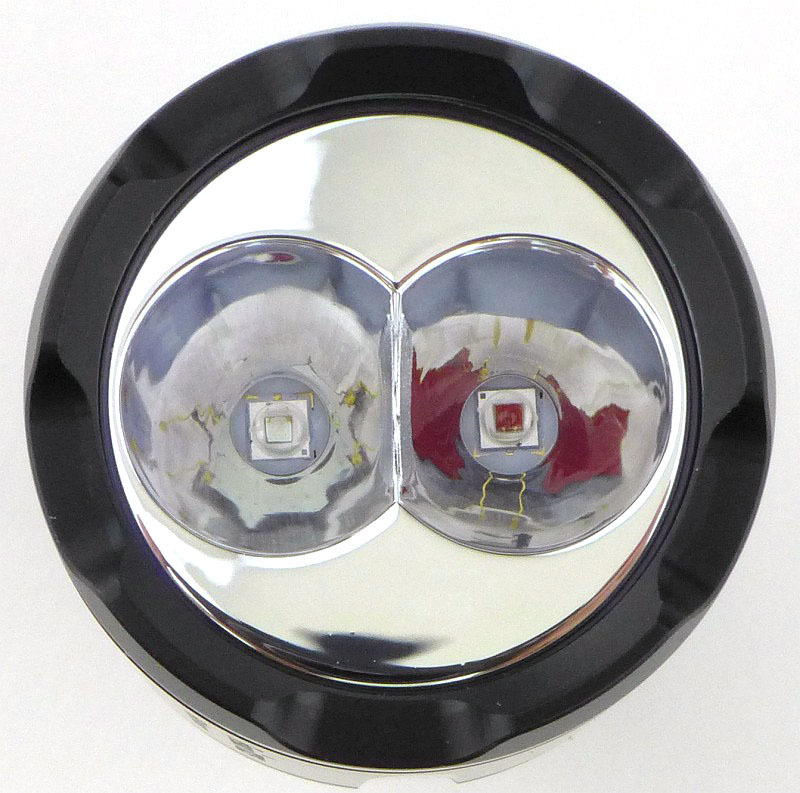 Often these will feature additional LEDs shoehorned into the head with the reflector being compromised. 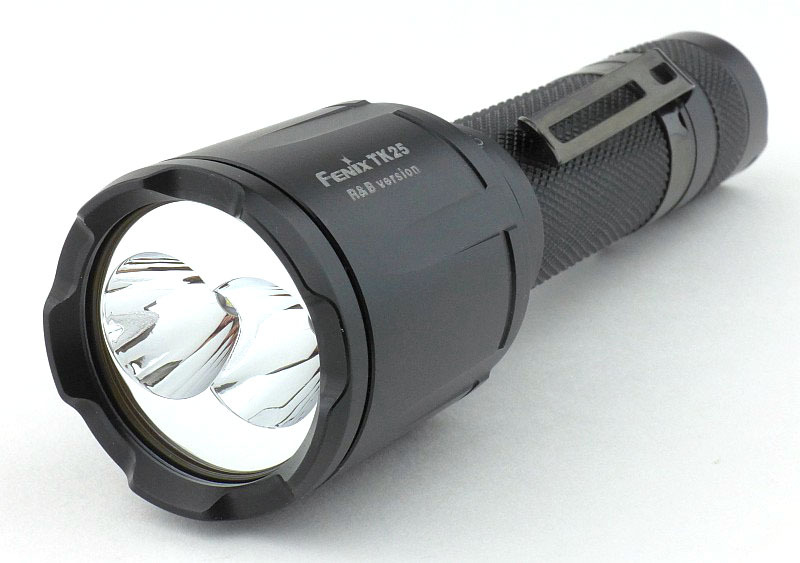 The TK25 is the first to feature the ability to swap the primary LEDs, effectively making the TK25 a fusion of two completely different lights. 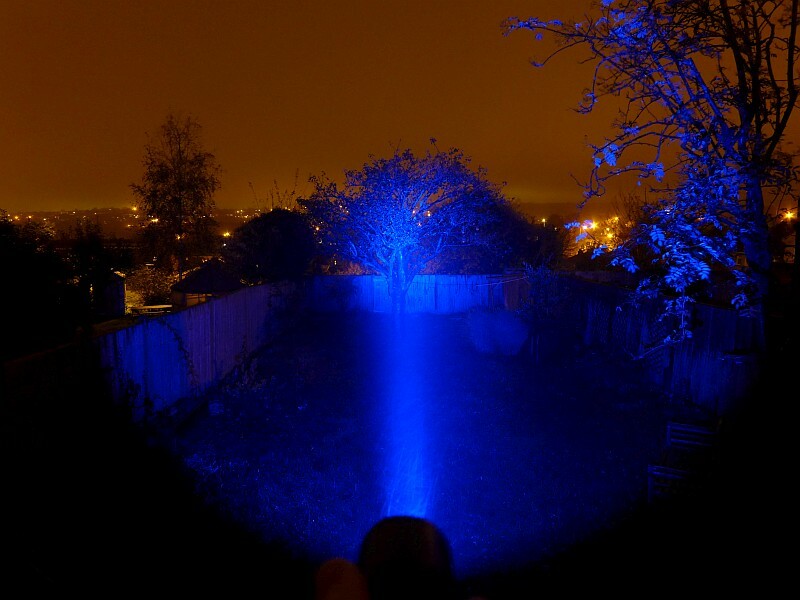 Simply twist the head, and change to a second set of primary LEDs. The model on test is the (non-musical) R&B version with White, Red and Blue LEDs. 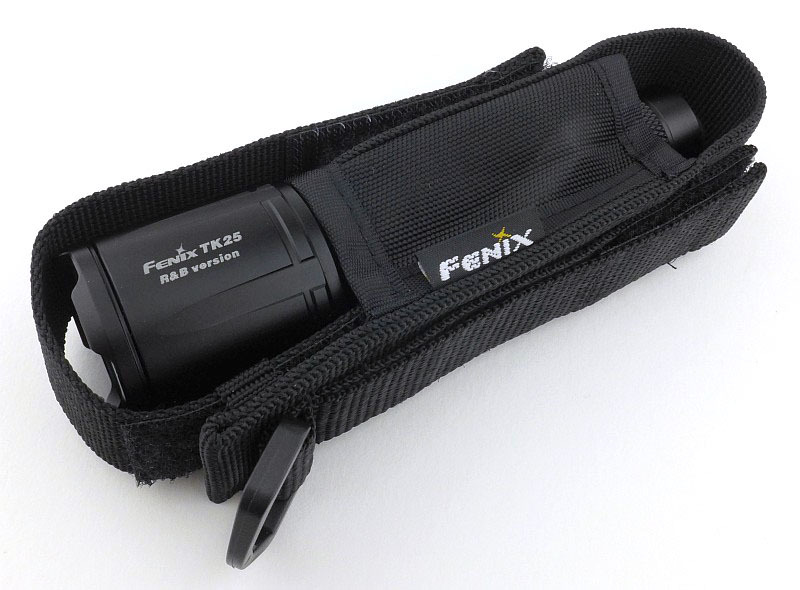 Recognisably a Fenix box with Orange highlights. 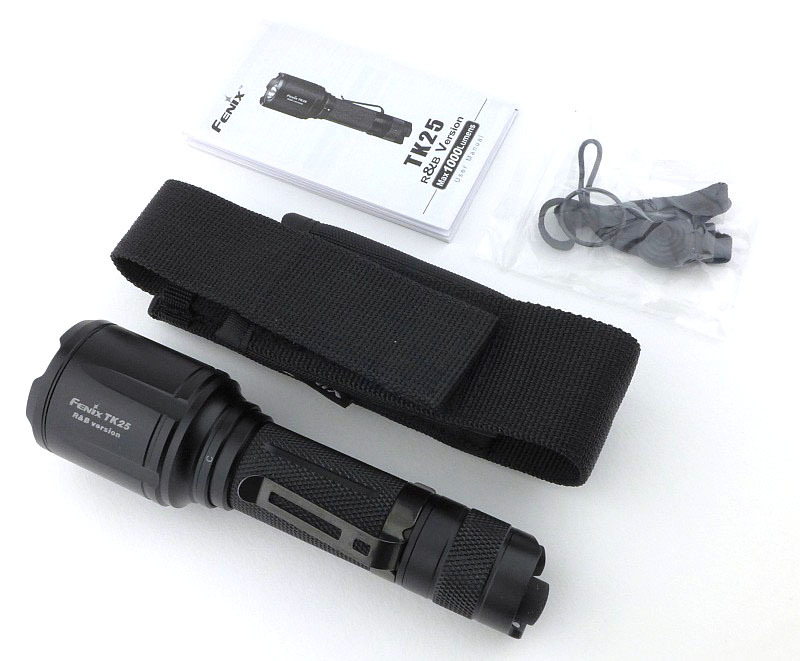 As well as the TK25 there is a holster, instructions and a small bag with O-ring and wrist lanyard. Due to the size of the head, the TK25 will only fit into the holster head-up. 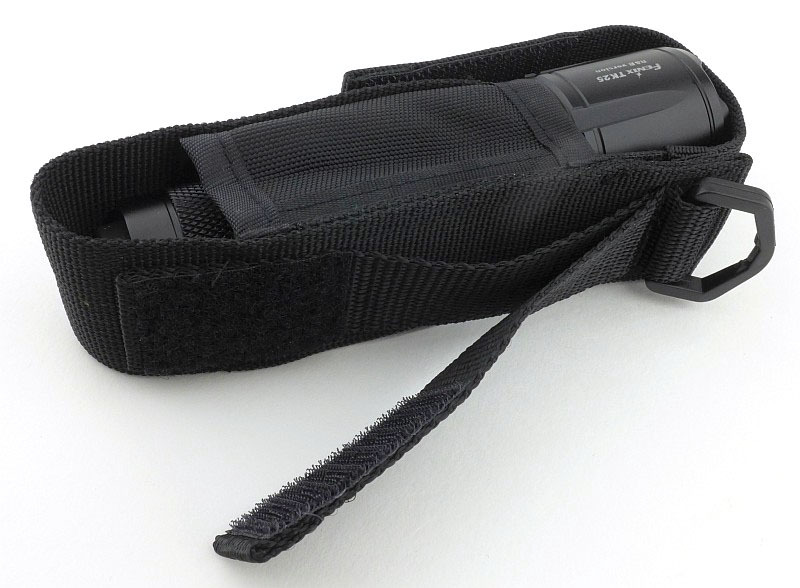 On the back of the holster is a fixed and Velcro belt loop as well as a D-ring. 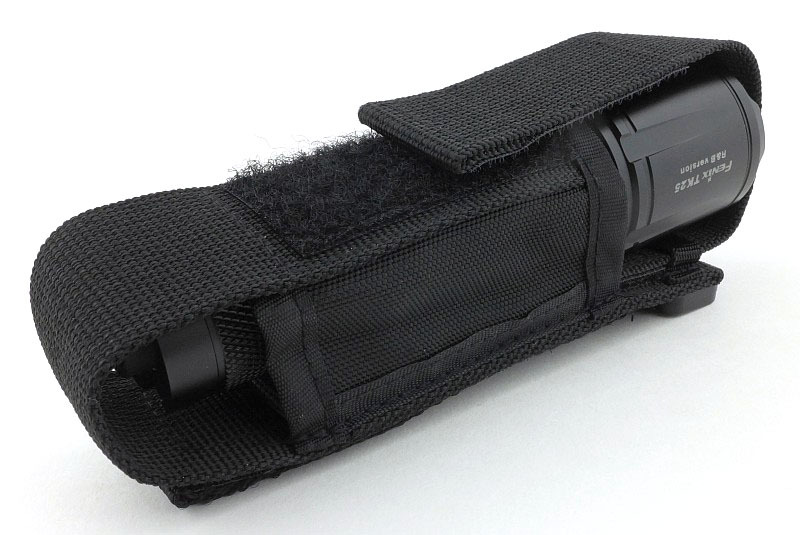 The holster is actually a universal holster with an adjustable flap. Here you can see the loop that keeps the flap from tearing away from the Velcro adjustment. 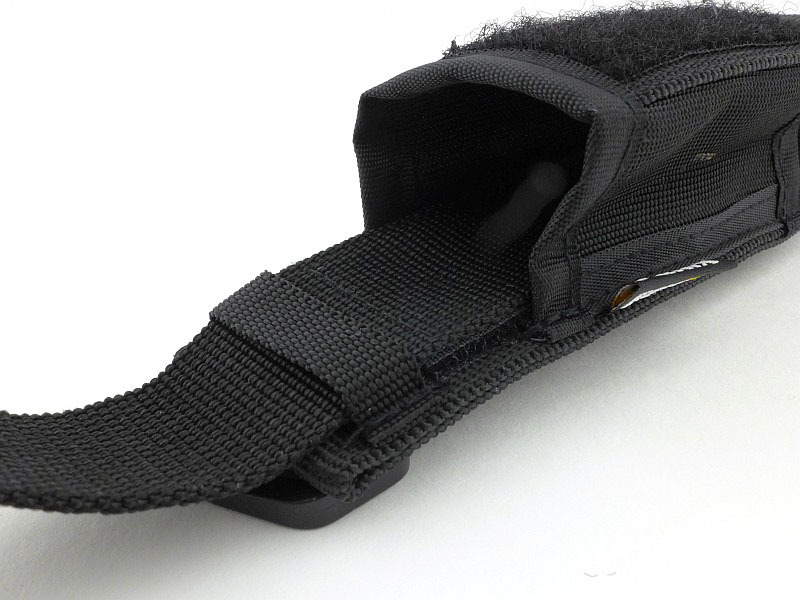 The end of the flap passes under this loop and into the holster compartment, where its length is set using the Velcro adjustment. Looking again from the side, you can see the additional ‘loop’ area on the flap which can set the flap to a much tighter/smaller position. Incorporating two primary LEDs (at a time) the head of the TK25 is relatively large, and the two reflectors do intersect. The model is laser engraved onto the side of the head. And now let’s look at that head and what it does. 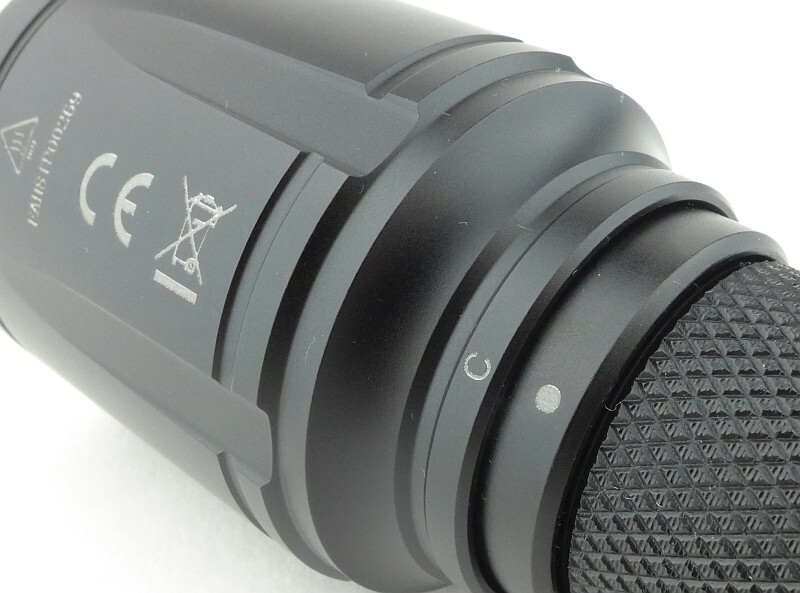 On the battery tube is a dot to mark which set of LEDs are currently selected. As you turn the head it lifts up, so it doesn’t hit the LEDs. As you continue to turn, it drops back down unto the next set of LEDs. With the indicator set to ‘C’ the XP-E2 (red & blue) LEDs are active. With the indicator set to ‘W’ the XP-G2 S3 (white) LEDs are active. 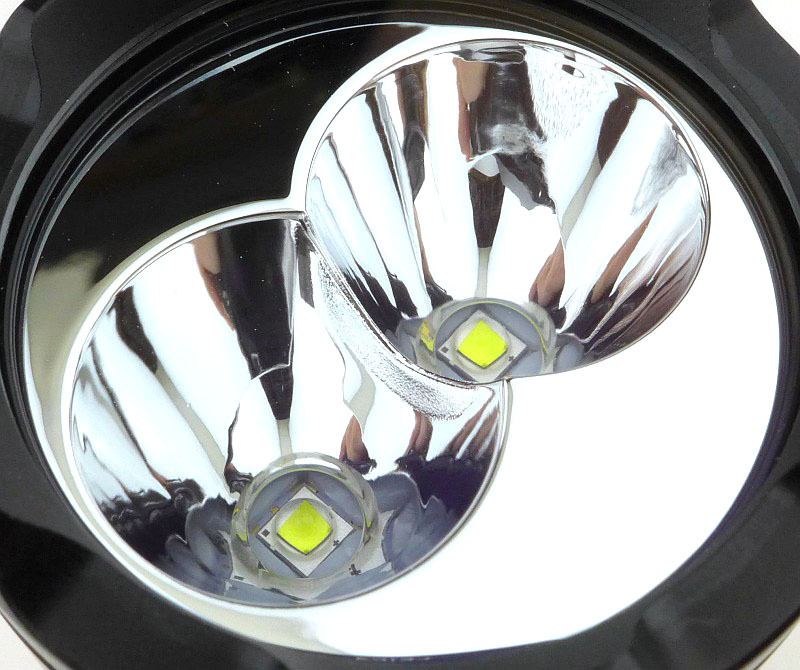 Looking at a slight angle as we swap LEDs, starting with the white XP-G2 S3. The reflector has now lifted off the LEDS. And now dropped back onto the XP-E2 LEDs. Back to the some of the other details, and the tail-cap threads are bare aluminium. 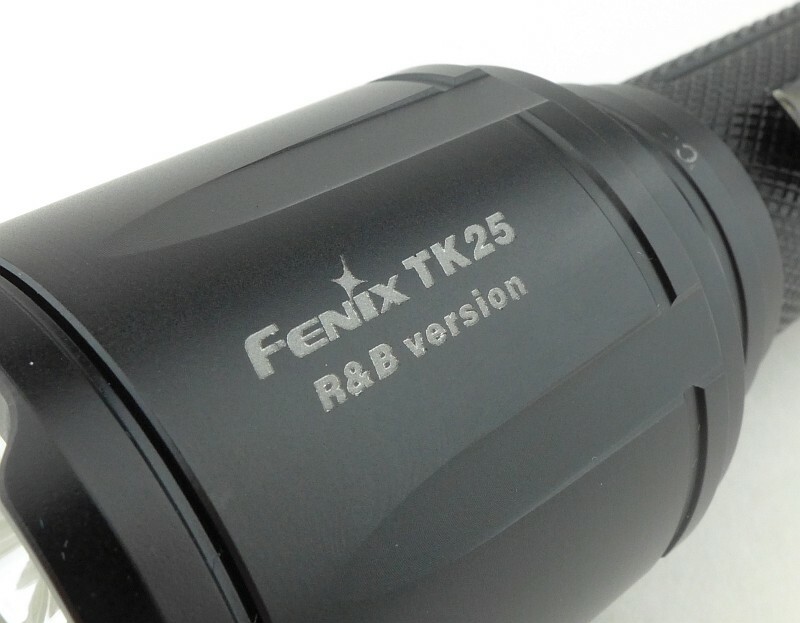 As with Fenix’s TK32, the TK25 features a battery tube sleeve that provides another connection between the tail-cap and the head (and makes it difficult to try and measure any parasitic drain). 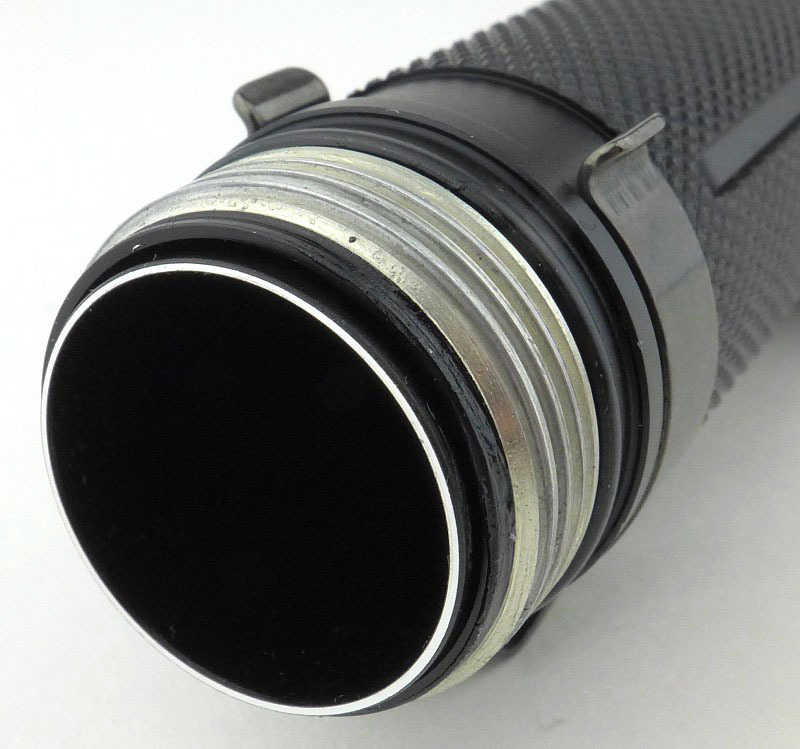 Inside the tail-cap there is the third contact surrounding the central spring that connects to that battery tube sleeve. On the tail-cap is a set of two switches, the main tactical switch and a smaller click switch for mode changing. 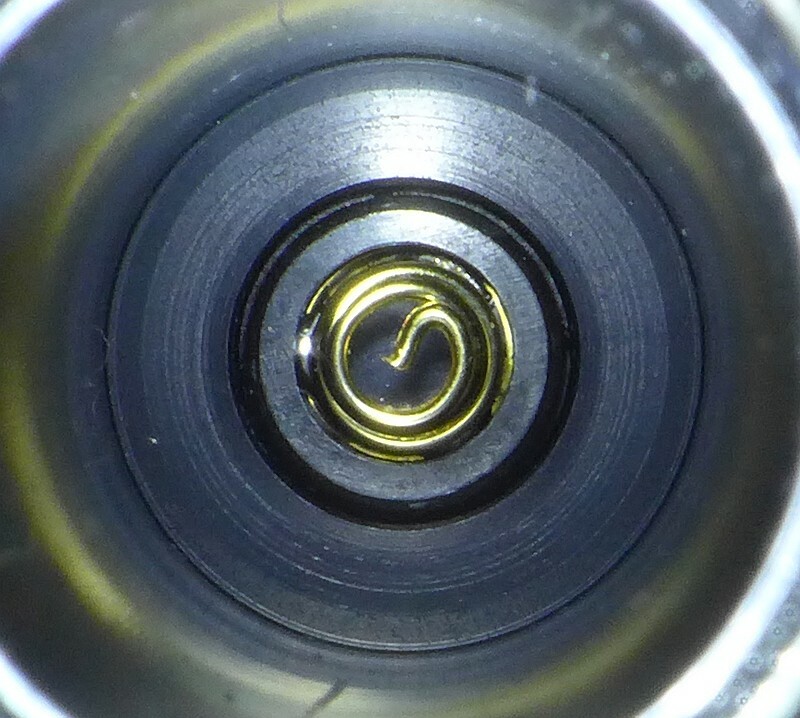 Peering into the battery tube shows the positive contact is a spring and this allows for the use of flat-top cells. 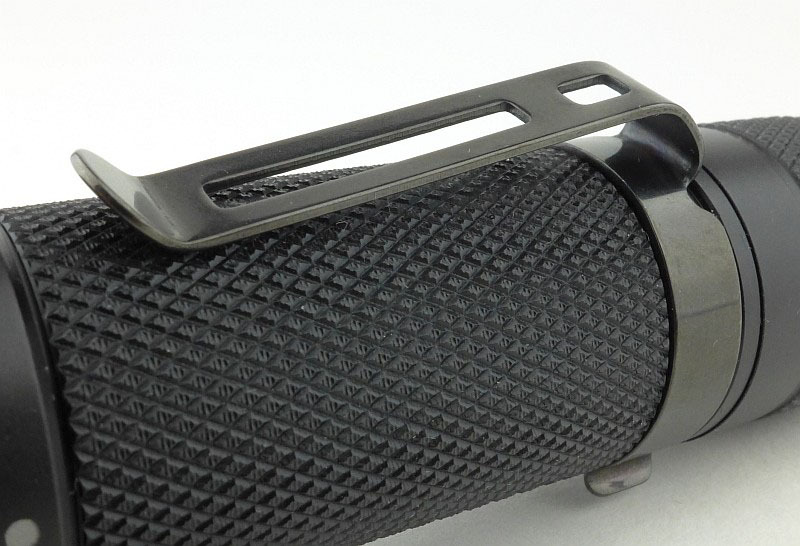 A steel pocket clip is supplied fitted to the TK25. 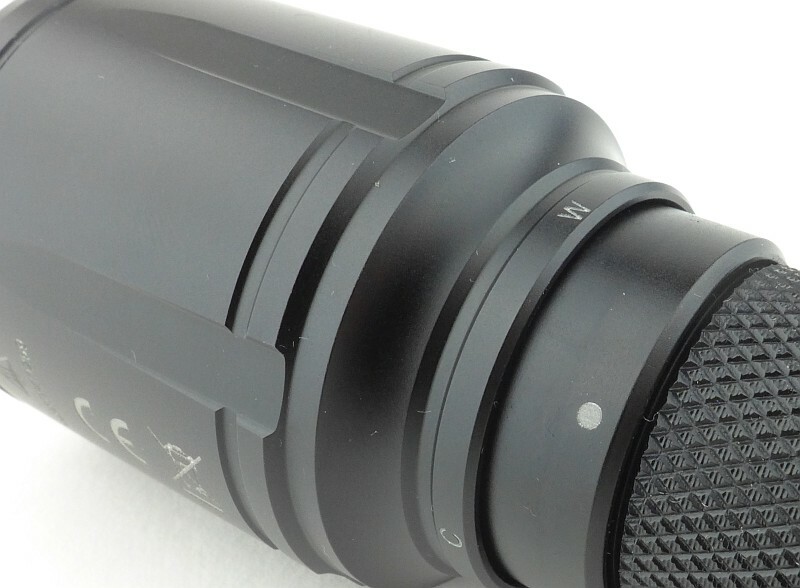 With the dual-switch tail-cap and a lanyard hole on one side, the TK25 cannot tail-stand. 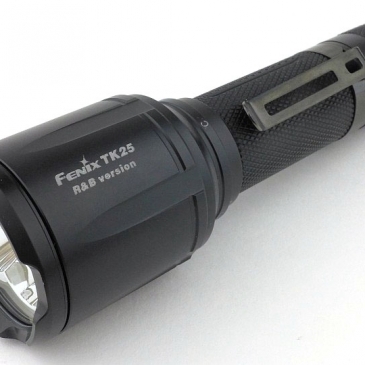 When running in white output, the TK25 has both LEDs lit. There is a dual compound reflector, so in the outer spill you can see some imperfections in the beam. However the main spill and hot-spot are well formed. 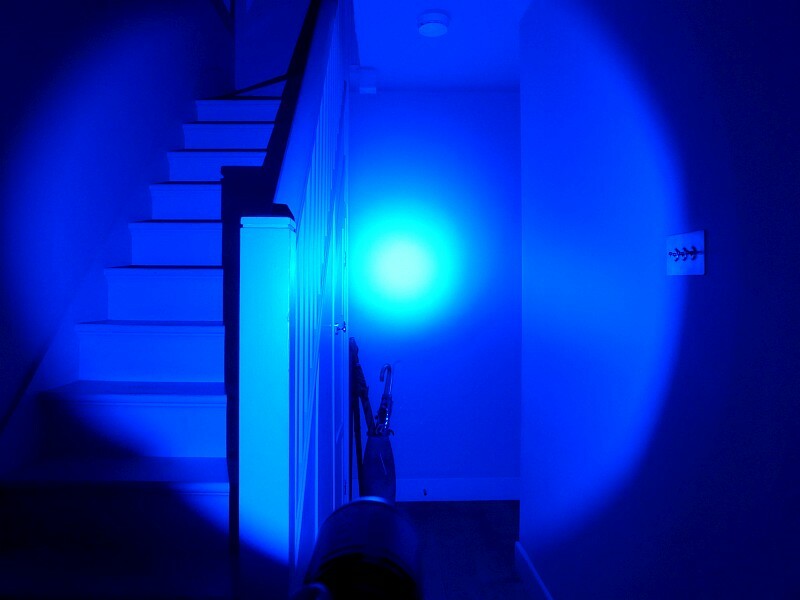 With two LEDs running you will notice some double shadow effects such as that shown by the newel post shadow on the stairs. Now with Red output, only one LED is running and the missing part of the reflector (due to the two reflector cones intersecting) shows as a bulge in the outer spill at around 4 O’clock in this picture. Switching to Blue and the same bulge in the outer spill is present, this time in the opposite 10 O’clock position. 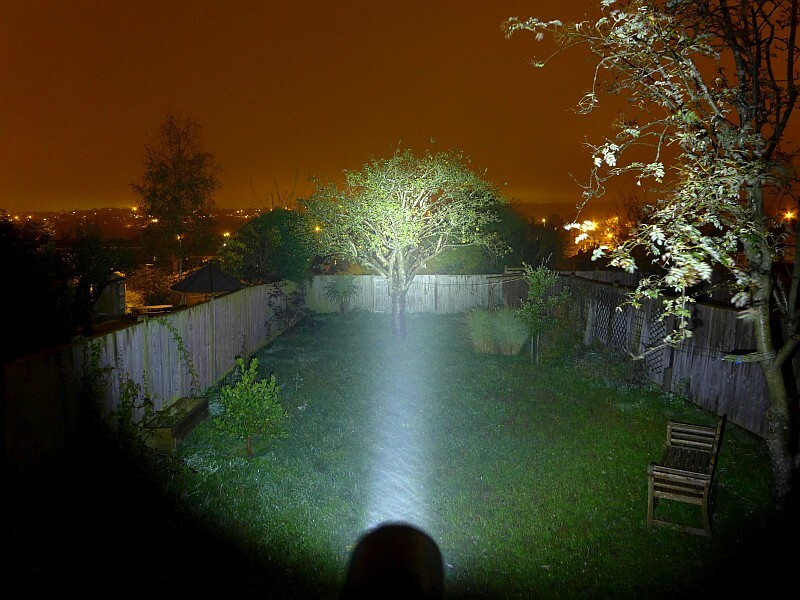 Moving outdoors (and excuse the murky weather causing the beam to show up more than it would normally) and the small reflectors are showing some limits in the brightness of the spill, but the centre of the beam still has good range. 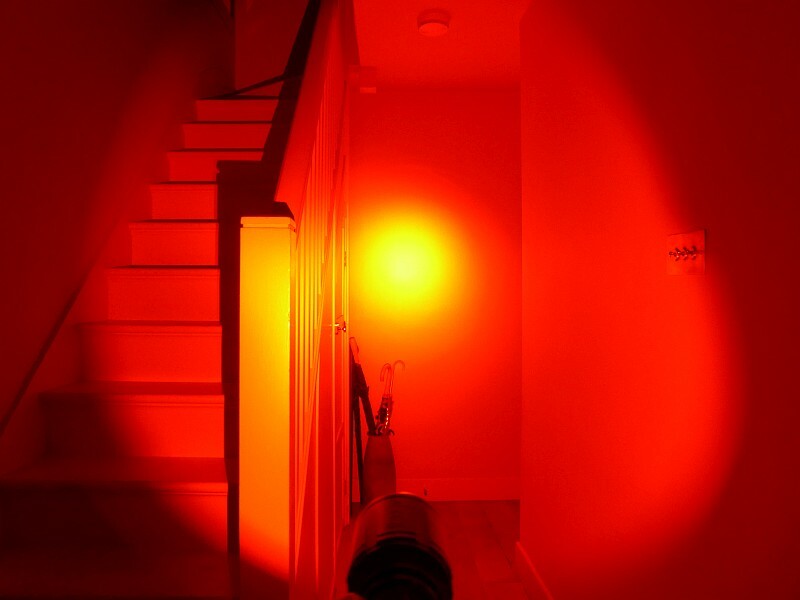 With only a single LED, the Red beam appears more focused, and the spill is slightly wider. The Blue output has a similar appearance to the red, but as I’m hand-holding the TK25 here the alignment is not quite the same. 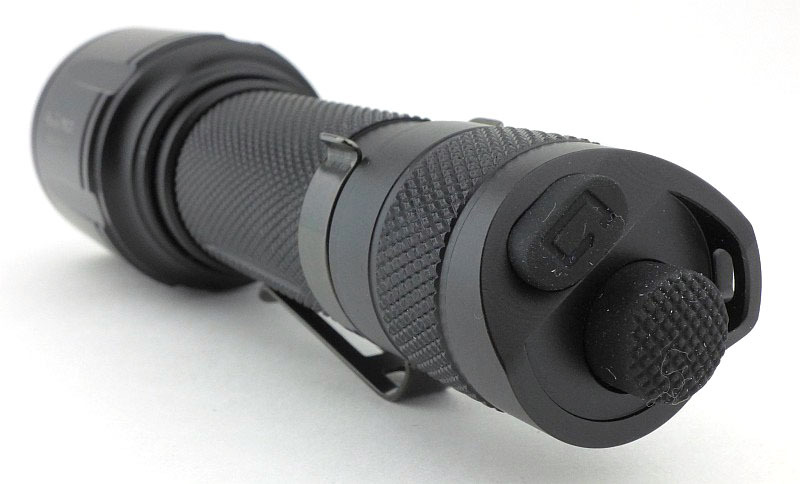 The TK25 has a dual-switch tail-cap with the main power switch being a momentary tactical switch and the secondary oval click switch is for mode changing. There are four constant white levels – Turbo, High, Med and Low, plus a Strobe mode. Changing LEDs to the coloured set and there is also a Red High, Red Low, and Blue output. 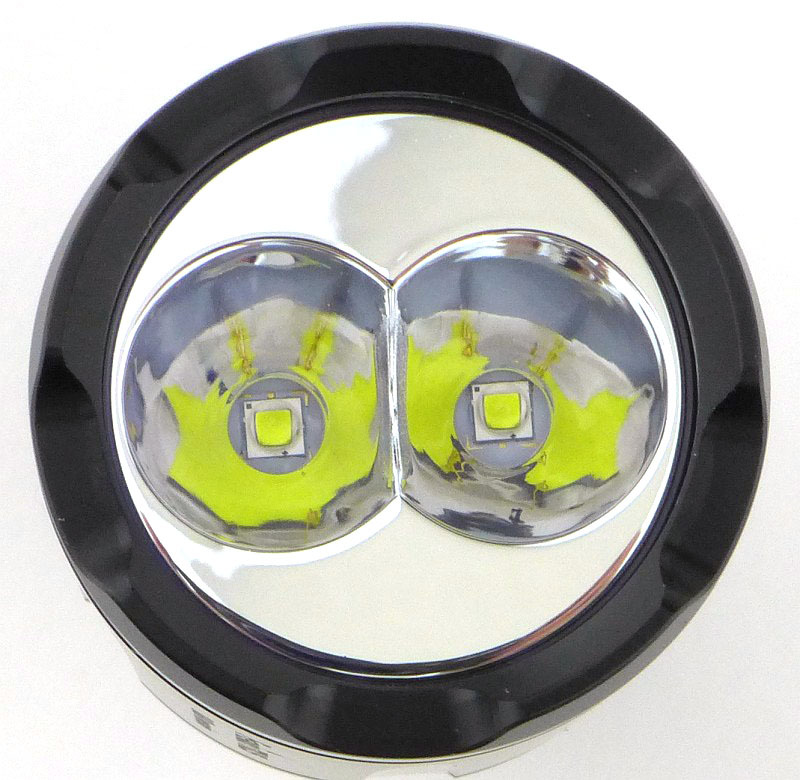 As a main feature, the TK 25 has the rotating head to change between sets of LEDs, so as a starting point the first thing to do is to rotate the head to the appropriate set of LEDs. This is assumed in the following description of the operation of the TK25. 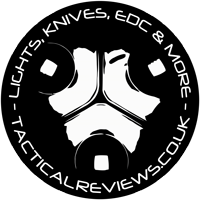 To access the White constant modes, either half-press, or fully press and click the tactical switch. The TK25 will come ON to the last used constant output level. Press the mode/function switch to cycle through the levels Low, Medium, High, Turbo, Low etc. Release the tactical switch or click again to switch OFF. For strobe, either, from OFF press (and hold) the mode switch (while doing this you can click on the tactical switch to lock the output on to strobe), or turn the TK25 onto a constant output mode by clicking on the tactical switch, then press and hold the mode switch for 2s. To stop strobe, depending on which method you used, either let go of the mode switch, or press the mode switch to return to constant output. The coloured outputs operate differently. 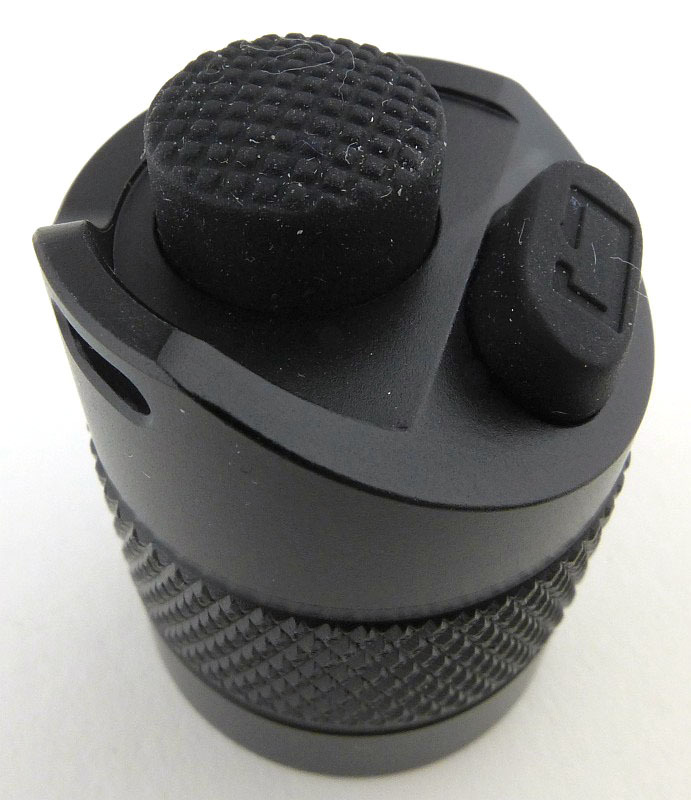 From OFF, the TK25 will always come onto Red High when pressing and holding the mode switch, or half-pressing or fully clicking the tactical switch. To access the Red Low and Blue modes, the TK25 must be ON (defaulting to Red High), then press the mode switch to cycle through Red Low, Blue, Red High etc. There is no coloured flashing mode. Rotating the head while the TK25 is ON will swap you between the Last Used White mode, and Red High. Even if you were using the Blue output, swapping to White and back again will revert to the default colour output of Red High. 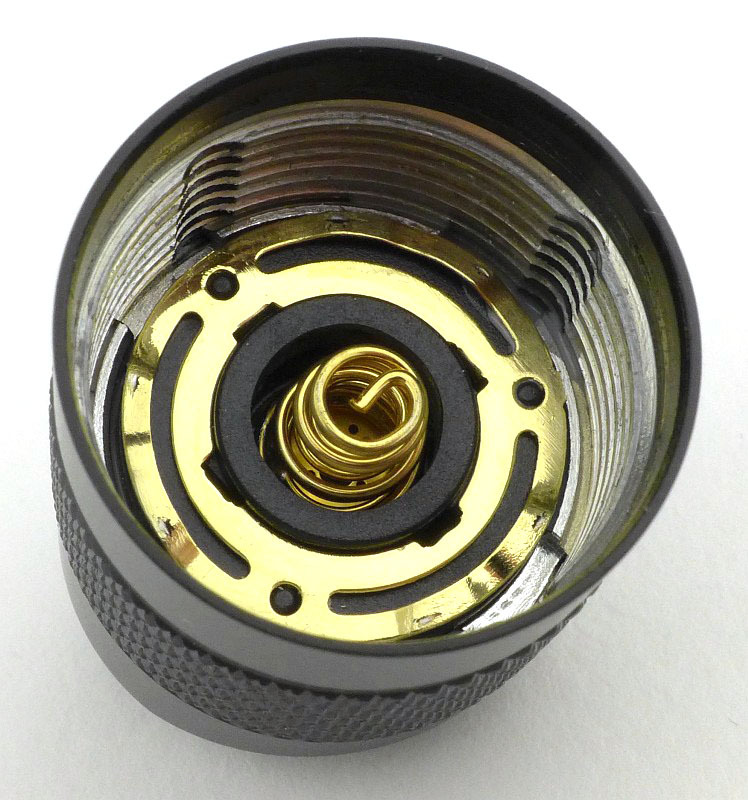 The TK25 runs on one 18650 (recommended) or 2x CR123. 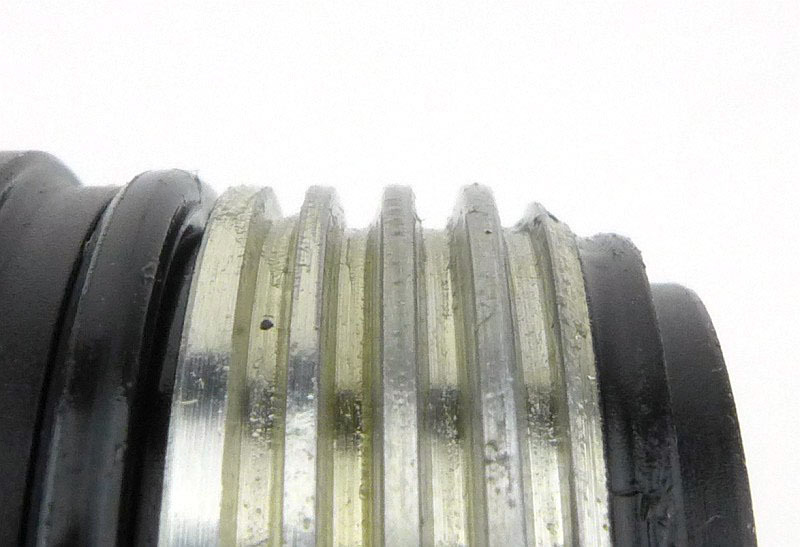 It was not possible to measure any parasitic drain due to the contact design. Typically Fenix lights display fully regulated output, but in this case the Turbo output on the TK25 is sagging over the first hour. 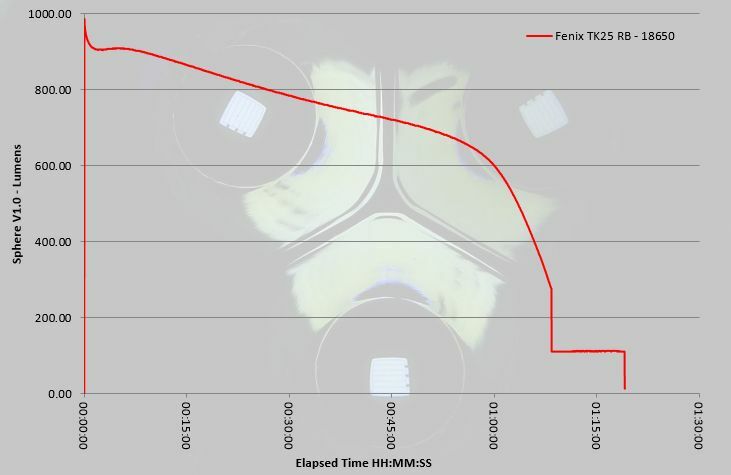 This may well be due to running the test with a Fenix 2600mAh cell, and if run with a higher current cell, it might have appeared stronger than this. Once the output has sagged to around 300lm, the TK25 shifts down to the medium output level, continuing on this until it shifts down again and ends the ANSI runtime, however the TK25 was still running on low at this point. The whole concept of swapping the primary LEDs is one I really like, and Fenix’s take on this makes a lot of sense as it allows for the LEDs to be permanently mounted onto the heat-sink, with the reflector assembly (which has no electrical or thermal connections to worry about) moving. However this does introduce two compromises in the reflectors as firstly each LED’s reflector is relatively small, and secondly the two reflectors intersect and so have a part that is missing. The only way to overcome this would be to make the head even larger than it is, or maybe even removing one reflector and making the TK25 into a four-in-one light with only one (rather than two) active primary LEDs. One little annoyance, made very obvious due to the head needing to be rotated, is that the pocket clip keeps slipping round whenever you turn the head. Considering the requirement to turn the head, it would be better if the pocket clip was anchored in place so it could not turn. A minor point perhaps, but I don’t like parts moving that should not be. The switch design does work nicely thanks to the second mode switch being placed onto a slightly lower angled area. It keeps it clear of the main switch, yet remains easily accessible. Though the are some milled out areas around the head, these don’t really do much for anti-roll, but the pocket clip does, so it will stay put on gently sloping surfaces once it rolls round to the pocket clip. With Fenix generally having such good mode sets and interfaces, I was slightly disappointed that the coloured output defaults to Red-High, instead of memorising the last used mode like the white output does. 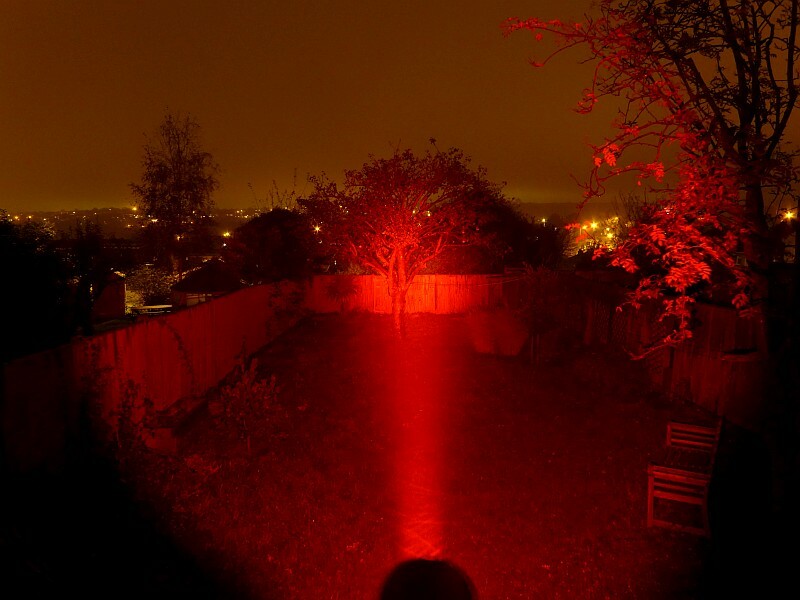 When a light includes a pure Red output this is more often than not used for preserving night vision – in which case it is vital to start on the Red Low output. I’d also like to be able to use the Blue output on momentary when I want to. Perhaps this is a restriction to stop users flashing the blue light (imposed by Law Enforcement Agencies), in which case that is understandable if a little frustrating. The small reflectors do result in a narrower beam than I’d personally like, but they are the compromise for having two ‘proper’ sets of LEDs available in one light. 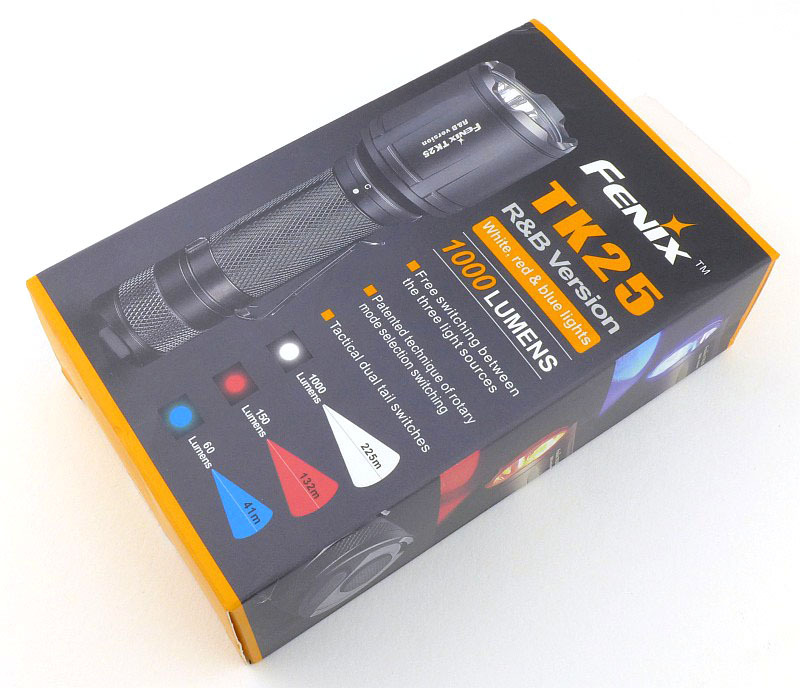 Though not perfect, the beams of all the LEDs are significantly cleaner than typical multi-colour lights, giving the TK25 a significant advantage over the fixed designs with ‘secondary LEDs’. Two sets of Primary LEDs. Swap with a twist of the head. 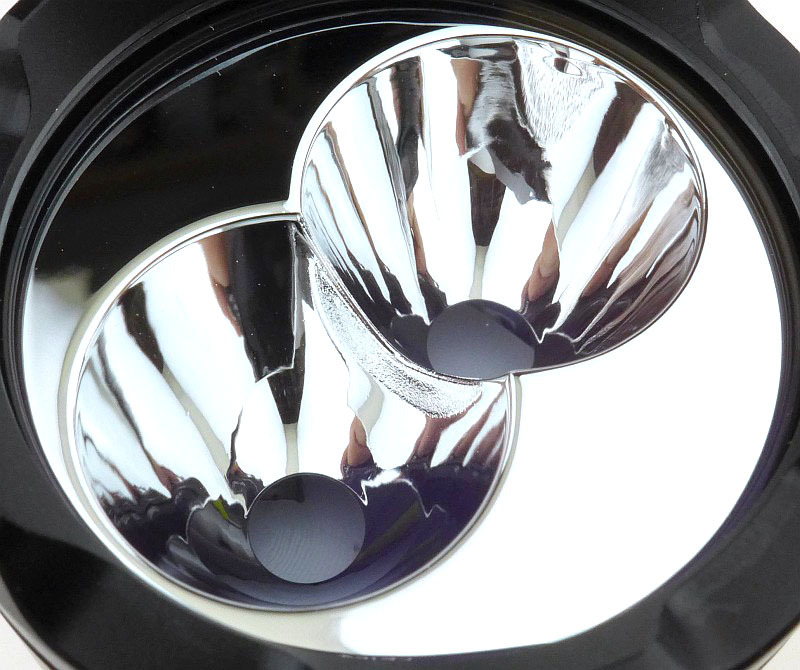 Dual reflectors are a little small and intersect. Switch between coloured and white output while ON. Pocket clip tends to slip round when turning the head. 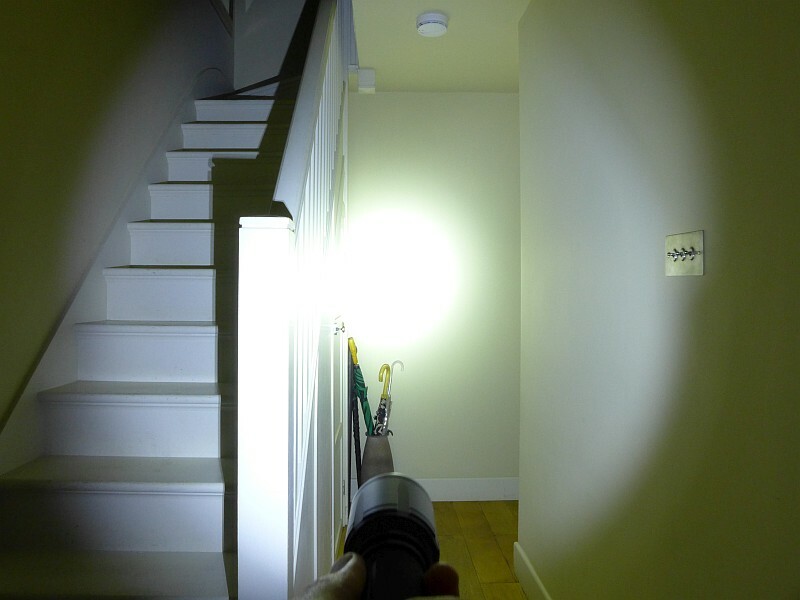 1000lm white output. Coloured output lacks memory and defaults to Red High.